The vehicle involved in a pursuit came to a stop in a farm pond on Juniper Lane. Both vehicle occupants waded out of the pond. 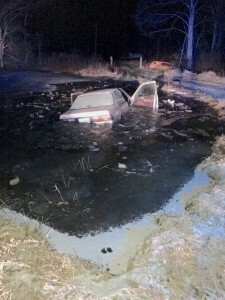 The driver of an auto involved in a Wednesday night pursuit was arrested after the vehicle he was operating went into a frozen farm pond. Sheriff’s Lt. Bryon Walker said he was patrolling in the Cabin Creek area after receiving several complaints from area residents concerning burglaries. Walker said he observed a vehicle with no tail lights and attempted to make a traffic stop when the driver of the vehicle sped off. A pursuit of about 16 miles ensued and as deputies were closing in on the area, the fleeing driver went onto a dead end road and traveled off the roadway in a curve, going into the pond.